Mitchell James Kaplan has lived and worked primarily in Paris and Los Angeles as a translator, screenwriter, and script consultant. Currently, he resides in Mt. Lebanon, Pennsylvania, with his wife and two children. This is his first novel. “Kaplan’s writing is exceptional, his intelligence and research on the subject superb. What did you know about the Spanish Inquisition (1478-1834) prior to reading By Fire, By Water? How did this story influence or increase your understanding of this historical period? In By Fire, By Water, trusting someone can lead to life or death. Discuss the various relationships in the novel that lead to both. What kind of trust do the characters have in God? How does trust vary depending on the character's social class or religious beliefs? How do the female characters, living in a strongly patriarchal society, acquiesce to or rebel against their culture's expectations of them? How does Judith break the mold for female behavior in her community? What about Judith catches Santángel's eye, and later compels him to seek her out? What kind of a father is Santángel? Early in the novel, he tells his son a story about a man with a "great treasure" who is unable to show it to anyone (pages 30-31). To what is this story alluding? Do you think Gabriel really believed his father was unfaithful to the church or was Gabriel trying to protect his father by staying away from him? What compels Santángel to learn about the Jewish faith? What is each group member's purpose for joining his secret religious meetings? How does the small group help, support, or hurt its members? 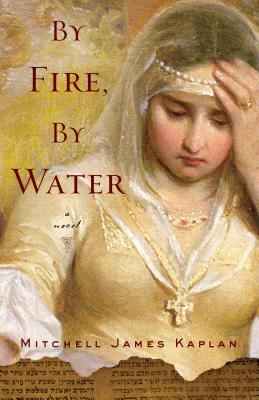 Discuss the significance of the novel's title, By Fire, By Water. The death of Felipe, Santángel's assistant, in many ways acts as a catalyst. Why do you think this is the breaking point for Santángel? How does his secretary's death affect his faith? Why do you think Leonor, Felipe's wife, feels so protective of Santángel when he is the one who allowed Felipe to join the secret group, and thus, is partially to blame for her husband's death? On page 97, Judith loses Levi for an afternoon and, in her search and worrying, reassures herself that, "History never repeats itself." Do you find evidence in the novel to support this claim? What was your impression of King Fernando and Queen Ysabel? How do the monarchs differ from Granada's emir? What do they have in common? What influence do religious leaders hold over the king and queen? How does this influence differ from that of Santángel and his money? Do you think any religious leaders have that sort of power today? Letter writing, transcription, and written history play an enormous part in the novel. In what ways do characters use written communication to help them? In what ways does it haunt them? What was your first impression of Estefan, Santángel's brother? How do the brothers' personalities and actions bring them to such different places in their lives? How did the author's depiction of Cristóbal Colón contradict or conflict with your own personal knowledge of Christopher Columbus, who famously discovered the NewWorld in 1492? Why is Colón so keen to push his foreign documents on Santángel? Do you believe their friendship was authentic, or was Colón merely interested in exploiting Santángel's influence on the king and queen? Discuss the meaning of exile in the novel and how various characters experience it both literally and metaphorically.